Stephon Dorsey is the sound designer for Skeleton Crew. 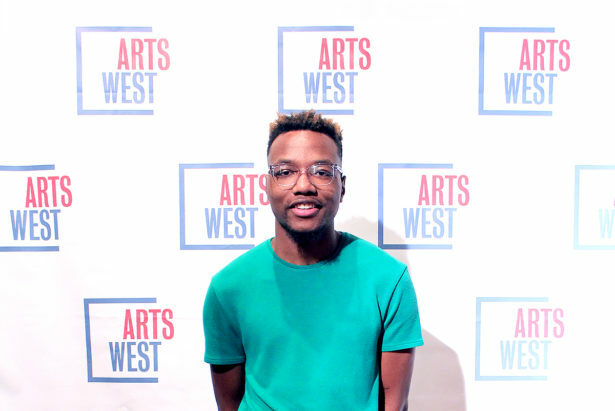 Other ArtsWest productions Stephon has designed include Peerless, Lady Day at Emerson’s Bar and Grill, and Hedwig and the Angry Inch. Stephon also performs as GOODSTEPH, a celebrated local music act. 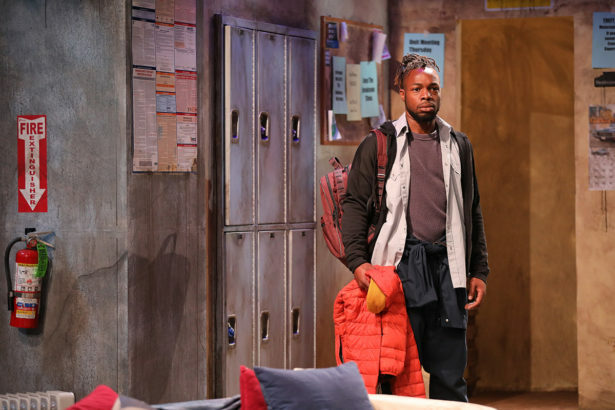 We sat down with Stephon to talk about Skeleton Crew, his Detroit roots, and how sound design brings audiences deeper and deeper into the world of a play. What’s your name, and what’s your role in the show? My name is Stephon Dorsey, and I am the sound designer for Skeleton Crew. Tell us briefly – what does a sound designer do? Basically, a sound designer designs all of the sound that you hear in the play, so that could be effects and/or music. Anything sonically that you would hear going throughout the space is my job. How did you end up designing for this show? Can you tell us about your connection to the material? It was kind of a – I don’t want to say random, but it definitely did come out of the blue. I just happened to be here at the right time. When it was brought to me, I was like, of course I’ll do it because I’m from Detroit. I know Dominique Morisseau. We went to the same high school. We were in the same theater program in high school. This work is about people and stories who are directly connected to who I am as a person. I think that when I look, and read, and now am looking at everybody in the play and listening to everybody’s words and dialogue, I see parts of myself in everybody in the play, or I know somebody in my family or a close friend who is actually in the play. It’s kind of crazy. When the opportunity came, I had to say yes. What’s a the day in the life of a sound designer like? I listen to a lot of music. I drive a lot, so I usually just like listening to sounds and creating a “mood” vision board playlist for the show. Just kind of gathering together all of my inspirations and the things that I feel like I can draw from to create. Then I’m at my computer, I’m finding sounds, and I’m chopping them up and turning them into instruments. I’m using drums that I’ve already like loaded into my computer and playing. Really, it’s a lot of playing, with this show specifically. There’s a lot of found sounds, but there’s also like a lot of drums and stuff that I’ve put together myself and composed. So it’s a nice, happy medium of me finding things as well as playing. And I live in a literal construction site. I’m in downtown Seattle. I tried going to do some field recordings, so I was able to get a little bit of sound from outside to feed into the work, but most of it is ambient stuff that I found. That’s kind of a day in the life. It changes for every show, but mostly the thing that is always present is the playing, I think. How does sound design fit into the rest of the show – what are audiences not even realizing that sound design is bringing to their experience? I think that the sound design is almost like an extra scene partner for the actors, and then also is a partner for the people in the audience too because it bridges them into the world so they can actually come there – because I feel like it without the sound, you’re just left with words and dialogue, which is good, but it’s like: okay, what’s informing these things – sound and lights. You know? I think that those elements inform the rhythm of the play as well as the emotion. I try to do that without giving away too much – when people are like, oh, something, something terrible is about to happen. When you feel the sound, you know either what’s happened or you should know what’s happening. Especially in this play, because we have these movement sequences in between a majority of the scenes and it directly informs the movement of the characters who are in those transitions. Their movement is built around the sound, and the emotion is conveyed through the sound that you hear. What else would you like to say about this particular work that you’re doing on Skeleton Crew? I think that, for me specifically, it’s – and I guess this will go back to process a little bit – the sound is inspired by a lot of the rhythms and sounds from my childhood. It is inspired by the voiceless, and the people who are continually trying to sustain their souls in Detroit. It’s inspired by J Dilla. Dilla is a crazy drummer, programmer, DJ, producer, and musician. And his story is kind of really similar to [Skeleton Crew] in the sense that, like, he worked himself so hard that like he drove his health, and then his livelihood, into the ground because he was always working. That’s a common theme, I feel like, throughout this play – be it a physical machine or the mental spiritual machine of the workplace, and of the company corporation versus humans – if you don’t find some type of way to sustain yourself, you’re going to go down. You’re going to die, or the machine is going to collapse. So, those sounds, it kind of feeds and trickles through the sound design for Skeleton Crew. You hear these bony, really icy-sounding sounds. It’s really bass-heavy. I think it’ll really give the audience members this really visceral feeling and kind of like creep them out just a little bit. I think if it was just the sound design, you should be taken to a place where you like walking down a creaky, drippy, like nasty hallway, or a tunnel, or something like that. And you’re like: there’s something about to jump out and get me. Your sound design for Peerless had some of those qualities. You like to creep people out, don’t you? [Laughs] I do. Yeah, I do. There’s something about it. Those are the sounds that I find, like, the easiest to like tap into – the darker soundtracks. 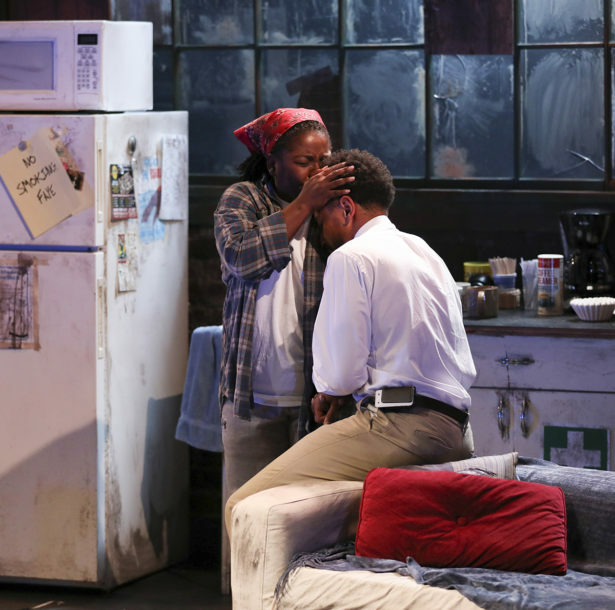 Skeleton Crew is about life in America and a story that is often swept under the rug – stories that are often swept under the rug. And people should come and see this show because it’s been swept under the rug and people need to know about it. What else would you like to say about this production? I’m grateful to be part of this. It’s definitely a dream come true to be able to do something that represents my city. So I thank you. You want to shout out any Detroit artists that people should check out? Absolutely. Let’s see…so many pop in my head. Sam Austins, Asante – a wonderful singer, producer – Benjamin Earl Turner is an amazing producer and rapper. DJ Frankie B – he’s a DJ. A-Craft is an amazing visual artist. 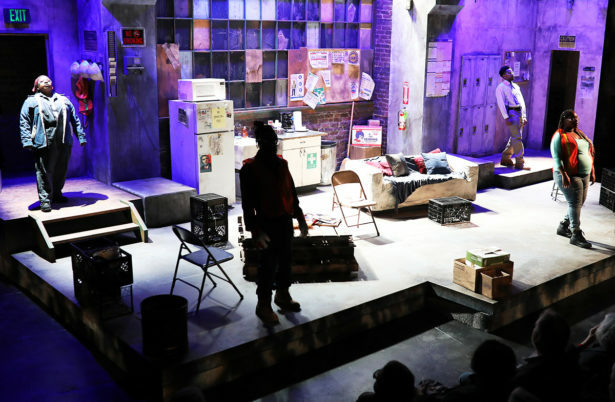 Skeleton Crew by Dominique Morisseau, directed by Jay O’Leary, plays through October 14, 2018. Get tickets here. This entry was posted on Wednesday, September 26th, 2018 at 12:25 pm	and is filed under General.